Last week I was in Omaha, NE, at the headquarters of InfoUSA (which produces the ReferenceUSA database) to participate with other public librarians in a "customer conference." Their goal was to get feedback from us on how we (and our patrons) use ReferenceUSA, and what we felt could be changed or added to improve the database. They also gave us a sneak peak at a bunch of new product offerings, as well as a tour of their facility and an overview of how they actually construct their database (and other products - they also produce the Polk City Directories). I felt a bit out of place in the group of librarians they assembled. Here I am, representing Chelmsford, MA (pop. 32,000), and the other librarians are from places like Dallas, Denver, Brooklyn, Oklahoma City, Pittsburgh, Kansas City, Annapolis - all bigger library systems by far. Most of them were also business specialists, and if it weren't for my undergraduate marketing degree, I would have been lost somewhere between the "SWOT analysis" and "B2C channel positioning." But we all had experiences and viewpoints to share, so it worked out. Upon the conclusion of the conference, my overall opinion was that I was very impressed. I had always trusted their data, in the same way I more or less trust the data and articles in the other databases the library subscribes to. But after the tour of their work area, their claim of "99% accuracy" really means something. 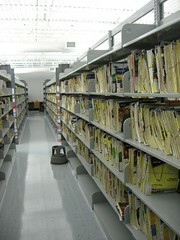 They subscribe to over 6,000 phone books from across the country (which they have in a resource library - see photo above), and then, using a variety of processes, move that information into their database. A lot of it is automated, with most of their software being proprietary and home-grown. But the emphasis was clearly on using actual people to review the data make intelligent decisions to ensure accuracy. And then those peoples' work was checked, and the checker's work was checked. Which all makes for a high degree of accuracy. I have some photos from the visit, most of which were provided by ReferenceUSA, as their facility and processes are industry secrets. The trip to Omaha was also fun because I stayed in the Embassy Suites, and got to visit the Omaha Library and the Lewis & Clark National Historic Trail. I don't want this to sound like a sales pitch for them, but I will say this: contact your sales rep and ask about being included in the next customer conference. It's worth it.